Recommended for: I would recommend this for anyone that wants to laugh and learn about Argentinian history. 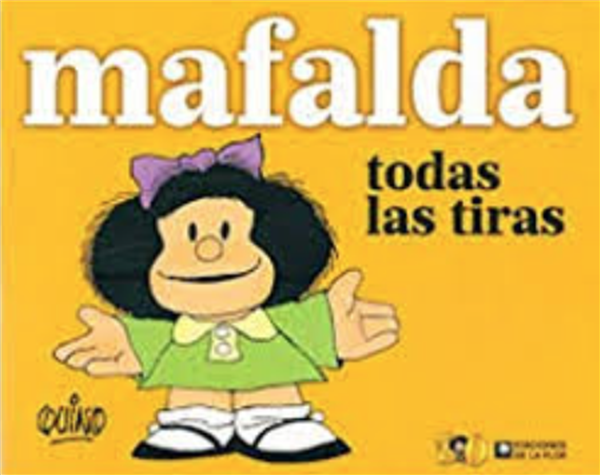 Brief overview: Mafalda is a six year old girl that lives in Argentina. Mafalda is worried about world peace and has some attitude problems but in an innocent way. Felipe: Lives in the same building as mafalda. Mama y Papa: Mafalda`s parents. Manolito: Son of a Spanish shopkeeper. Setting: This comic strip is set in Buenos Aires, Argentina. Last Worlds: Mafalda is my favourite comic strip character and I think that everyone who wants to have a good time must read it.